Don’t worry Your Father’s got this! I love the fact that we serve a God who knows our needs even better than we do. He is not unaware of our individual situations and cares but instead He knows and is willing to supply all our needs according to His riches in glory, through Christ! How often do we live as if He didn’t? How much time do we spend worrying and fretting over temporal things while we let the things that will make an eternal difference slide? In the book of Luke, Jesus makes it pretty clear that God is more than capable of taking care of all our needs when we seek the Kingdom of God first. We need to major on the majors and minor on the minors! 22 Then Jesus said to his disciples: “Therefore I tell you, do not worry about your life, what you will eat; or about your body, what you will wear. 23 For life is more than food, and the body more than clothes. 24 Consider the ravens: They do not sow or reap, they have no storeroom or barn; yet God feeds them. And how much more valuable you are than birds! 25 Who of you by worrying can add a single hour to your life? 26 Since you cannot do this very little thing, why do you worry about the rest? 27 “Consider how the wild flowers grow. They do not labor or spin. Yet I tell you, not even Solomon in all his splendor was dressed like one of these. 28 If that is how God clothes the grass of the field, which is here today, and tomorrow is thrown into the fire, how much more will he clothe you—you of little faith!29 And do not set your heart on what you will eat or drink; do not worry about it. 30 For the pagan world runs after all such things, and your Father knows that you need them. 31 But seek his kingdom, and these things will be given to you as well. These words must have seemed so radical to the multitudes listening. These words are still radical today to those of us who have chosen to follow Him! Jesus is telling us to live with eternity on our mind. He is telling us seek Him first! He is telling us to not allow any possession to have a hold on us! He is telling us to trust Him with all our needs! He is telling us to believe that our Father, who clothes the wild flowers is MORE than capable of clothing us with all our needs! He is telling us we are not to live as the pagans live, worrying about how they will take care of all their own needs but we are called to live a life of obedience and service, with God providing for us as we put Him and His Kingdom first! Radical, radical, radical! 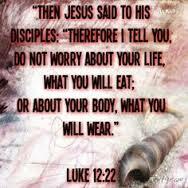 I love that Jesus said, “And do not set your heart on what you will eat or drink; do not worry about it. For the pagan world runs after all such things, and your Father knows that you need them. We do NOT serve a god who is dead, we serve GOD who is alive and knows are needs! Now that is good news! The next time you find yourself in a situation that would typically cause you to worry or fret remember these words! YOUR FATHER KNOWS YOUR NEEDS! Instead of worrying, bring your needs to the ONE who is more than capable of taking care of any situation. The Creator of the Universe. Jehovah Jireh, our Lord and Provider! Put God first. Put His Son first. Put the Kingdom of God first. When we do this, we have NOTHING to worry about. He promises to take care of all our needs! Matthew 6:33 NIV 33 But seek first his kingdom and his righteousness, and all these things will be given to you as well. Christ is coming back for a church that is longing for His return. Don’t allow anything or anyone to cause you to worry, fear or distract you from that fact. Keep the Kingdom of God as your heart’s treasure. Be dressed and ready for service and keep your lamp burning! Be ready for the Son of Man when He returns for you, His bride!